Get enchanted by sailing the mighty Nile River on board the luxurious Dahabiya Nile Cruises in Egypt, the Sonesta Dahabiya Nile Cruise. Enjoy the charm of the ancients combined with many modern facilities and more. All 5 cabins and 2 suites have large, panoramic windows. Bathrooms equipped with full size tubs. Embarkation in Luxor before lunch, lunch on board. Enjoy an excursion to visit Karnak Temple and Luxor Temple, dinner on board, overnight in Luxor. Breakfast on board, visit the Valley of the Kings in the West Bank, visit the West Bank Continue to the Valley of the Queens, the temple of Medinet Habu and the Colossi of Memnon. Lunch on board, sail to Esna, dinner and overnight on board. Breakfast on board, enjoy the day at leisure, continue sailing on the Nile, dinner and overnight on board. Breakfast on board, sail to Edfu, enjoy a wonderful excursion to the Temple of Edfu, Lunch on board, dinner and overnight on board the ship. 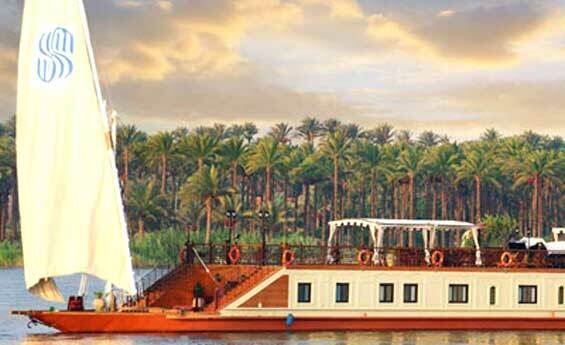 Today you will sail on the way to Kom Ombo,Overnight moored beside a Nile Island. Breakfast on board, visit the ptolemaic temple dedicated to the crocodile god sobek and the falcon-headed Horus in Kom Ombo. Lunch on board, proceed to Aswan, dinner and overnight on board. Breakfast on board, visit the famous Aswan High Dam, the Old Dam, the Philae Temple, dedicated to the goddess Isis, dinner and overnight on board. Breakfast aboard the Dehabeya, disembarkation after breakfast. Embarkation before lunch, enjoy the day relaxing at leisure in Aswan. Breakfast on board, visit the Aswan High Dam, the Old Dam, the Philae Temple, dedicated to the goddess Isis, lunch on board, sail to Kom Obmo, dinner and overnight near Kom Ombo. Breakfast aboard, sail to Kom Ombo To visit the ptolemaic temple dedicated to the crocodile god sobek and the falcon-headed Horus, lunch on board, dinner and overnight moored beside a Nile Island. Breakfast on board, enjoy the day at leisure, then sail to Esna, pass the lock, dinner and overnight beside a Nile Island. Breakfast on board, sail to Luxor, visit the magnificent Karnak and Luxor Temples, Lunch on board, dinner and overnight on board the ship. Breakfast on board, visit the Valley of the Kings in the West Bank, visit the West Bank Continue to the Valley of the Queens, the temple of Medinet Habu and the Colossi of Memnon. Lunch on board, dinner and overnight in Luxor.